At Discovery Optometry in Vernon BC , we know managing dry eye involves a multi-faceted approach. We acknowledge the impact that environment, diet and lifestyle, systemic health and medications have on dry eye, and we manage these variables accordingly. 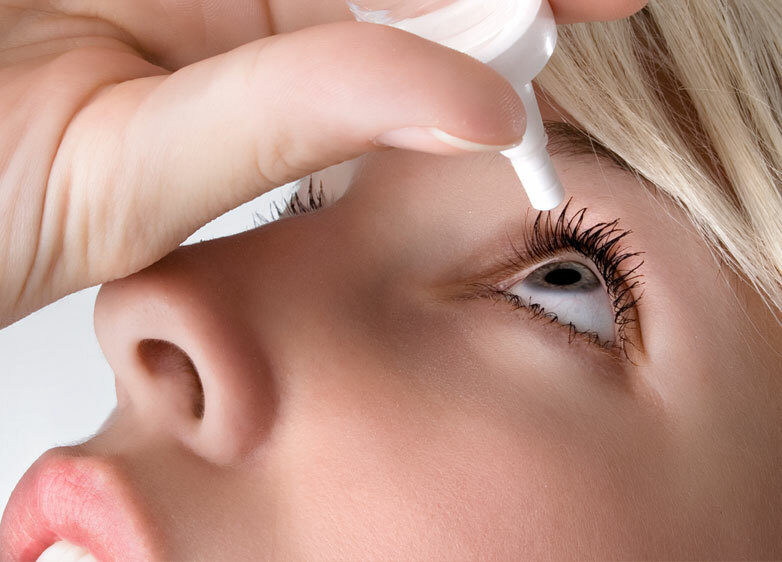 We also prescribe “smarter” ocular surface lubricants: drops that are minimally (or non-) preserved and contain minerals, electrolytes and muco-adhesive agents for improved retention and ocular surface health. Perhaps most importantly we recognize the role inflammation plays in dry eye. Certainly, the increasing use of omega-3 supplementation, doxycycline, corticosteroids and cyclosporine underscores the importance of controlling inflammation in dry eye. Add in adjunctive (though no less important) therapies such as punctal occlusion and eyelid hygiene, and it is apparent that we have a great deal to offer dry eye patients. Indeed, the future of dry eye management looks even brighter. With androgen supplementation, mucin stimulants and lacrimal secretagogues in development, we are quite possibly entering an era of curative treatment for certain types of dry eye. WHY DO EYES BECOME DRY? 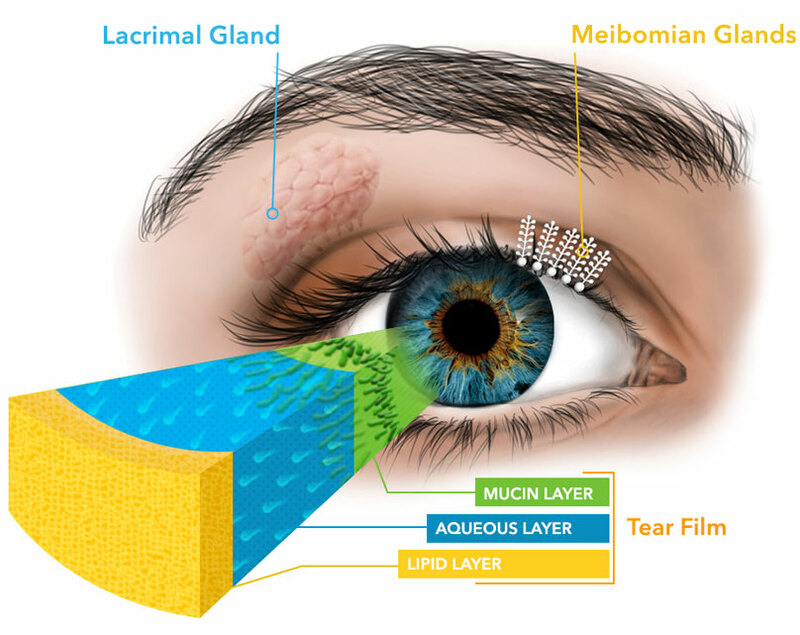 Aqueous Deficient Dry Eye occurs when the production of tears by the lacrimal gland is not adequate, or when changes to the tear producing glands produce lower quality tears. A deficit in tear production may be the result of other underlying medical conditions such as rheumatoid arthritis, lupus, or Sjogren’s Syndrome. Aqueous Deficiency Dry Eye can also be indicative of a temporary or permanent damage to the lacrimal glands caused by trauma, local or central nerve damage or from chemotherapy and radiation treatments. Most patients suffer from Evaporative Dry Eye – a condition where the tears produced are of poor quality and evaporate too quickly due to a lipid or mucous deficiency of the tear film. Your North Toronto Eye Care doctor will examine your eye using a slit lamp in order to see blocked/inflamed gland openings and/or frothy tears characteristic of evaporative dry eye. The consistency and quality of your tears will also be assessed. Our eyes need a constant layer of tears – called the tear film – to maintain and protect the sensitive surface tissues. 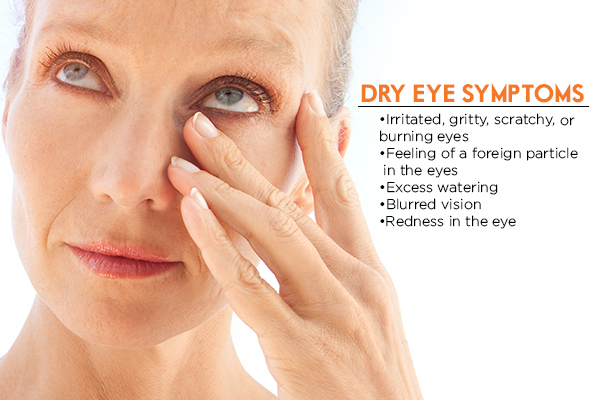 Dry eye syndrome occurs when there is a lack of adequate tears. For some people, the cause of dry eyes is an imbalance in the composition of their tears. Other people don’t produce enough tears to keep their eyes comfortably lubricated. 1) Lipid (oil) layer: Outermost Layer which lubricates the eyes and helps prevent tears from evaporating when the eyes are open. 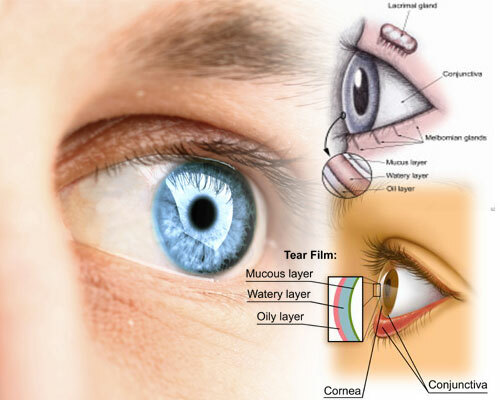 2) Aqueous (water) layer: Middle Layer that is composed of water and nutrients that lubricate and nourish the cornea. 3) Mucin layer: Innermost Layer that coats the surface of the cornea and makes the tears adhere to, and spread evenly over the surface. Changes or disruption to any one or more of the three tear film layers may interfere with the process of routine lubrication of the eye surface, resulting in Dry Eye Disease.